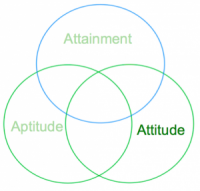 Triangulating Attainment, Attitude and Aptitude: To Identify Student Learning Needs And Provide Targeted Interventions To Improve Primary/Elementary Pupil Outcomes. The collection of pupil attainment data in schools is nothing new, but attainment data is only part of the picture. At Garden International School, in Kuala Lumpur, we know that data only becomes effective if it stimulates questions, meaningful dialogue and discussion and actions that make a difference to student learning. During this session I will share how we have changed our approach to the kind of pupil data we collect, and the way we use it to better support learning for all our students across the Primary (Elementary) School. Gain a better understanding of the importance of triangulating data for maximum impact – – The 3 As! If you are interested in this area and want to start exploring it, please tweet me @susanwalter99 or comment below. Triangulating Attainment, Attitude & Aptitude: To Identify Student Learning Needs And Provide Targeted Interventions To Improve Primary/Elementary Pupil Outcomes.